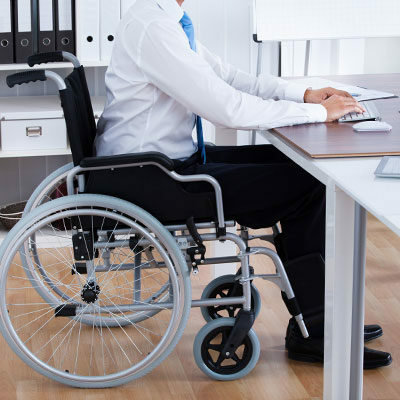 Disability Discrimination in the Workplace | Thompson Legal Center, LLC. Disability Discrimination in the Workplace | Thompson Legal Center, LLC. minor (even if the person does not have such an impairment). If an employee or job applicant is qualified, and disabled in one of three ways mentioned above, the employer is legally required to provide a reasonable accommodation, unless doing so would cause significant difficulty or expense to the employer. A reasonable accommodation is any change in the work environment, or in the way things are usually done, to help a person with a disability apply for a job, perform the duties of a job, or enjoy the benefits and privileges of employment (e.g. making the workplace accessible for wheelchair users, providing a reader or interpreter for someone who is blind or hearing impaired). An employer does not have to provide an accommodation if doing so would cause undue hardship to the employer. An unduehardship means that the accommodation would be too difficult or too expensive to provide when considering the employer&#39;s size, financial resources, and the needs of the business. Disability discrimination occurs when an employer or other entity covered by the amended Americans with Disabilities Act, or the amended Rehabilitation Act, treats a qualified employee or applicant unfavorably because the individual either has a disability, has a history of a disability, because the individual is believed to have a physical or mental impairment that is not transitory, and minor. The law forbids discrimination when it comes to any aspect of employment, including hiring, firing, pay, job assignments, promotions, and any other term or condition of employment. The law also protects people from discrimination based on their relationship with a person with a disability (even if they do not themselves have a disability). It is illegal to harass an applicant or employee because the individual has a disability, had a disability in the past, or is believed to have a physical or mental impairment that is not transitory and minor. The law does not prohibit simple teasing, offhand comments, or isolated incidents that are not very serious, however, harassment is illegal when it is so frequent or severe that it creates a hostile or offensive work environment or when it results in an adverse employment decision. Potential harassers can be the victim's supervisor, a supervisor in another area, a co-worker, or someone who is not an employee of the employer, such as a client or customer.